I was at home all throughout the 5 day visit (January 15-19, 2015) of his Holiness, Pope Francis, in my home country the Philippines. Because I had to work and I was not able to avail of the 5-day holiday in Metro Manila (albeit luckily, I was working via telecommute at home), I had no chance to go to any of the places the Pope would pass through . 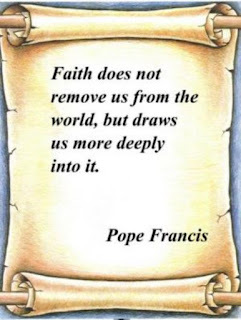 I am an avid fan of Pope Francis. Catholic? Yes. 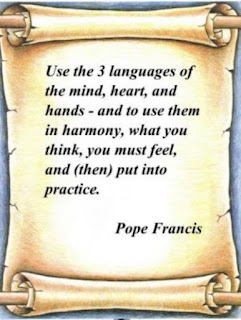 Devout and practicing? 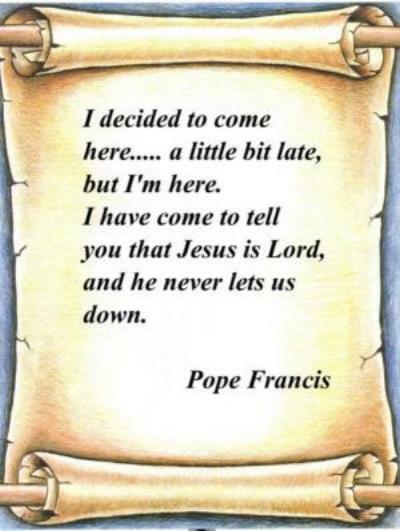 Well, I do go to church to hear Mass on Sundays and Days of Obligation, and I say my prayers every now and then. Honestly, though, I cannot say that I am a very good Catholic - trying maybe, but not yet there. Fortunately for me and the others who did not go outside of their homes, our era has given us the advantage of television, radio, and Internet live stream. I made sure that I tuned in to every broadcast activity of the Pope. If I cannot see him in person, at least I could get to hear his words to the Filipinos and to the world. Indeed, I was not disappointed. 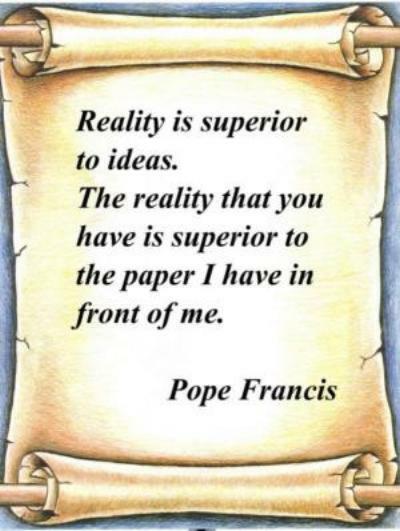 Pope Francis was an eloquent homilist, an emphatic preacher, and a truly effective pastor. 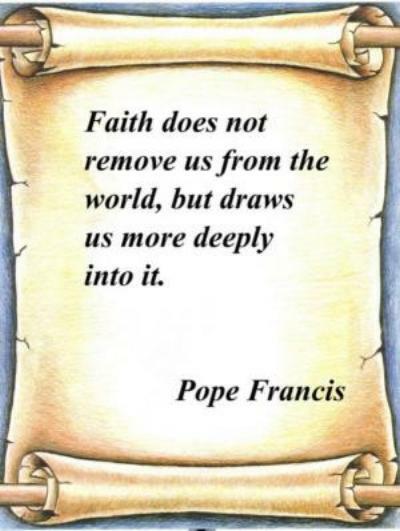 I listened to his sermons and took note of the sayings that really struck me to the core. I made the quotes into memes and arranged them in the order of when and where they were said. The capacity to dream is our ability to hope. If a person loses hope, he allows himself to fall into self-pity and despair. When you are in such condition, you heart and mind is blinded by selfishness and hopelessness. 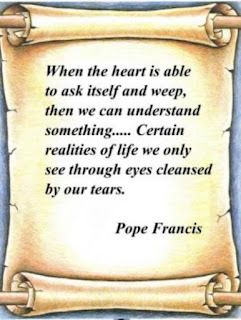 How indeed can you see through the eyes of love if despair has clouded your sight? 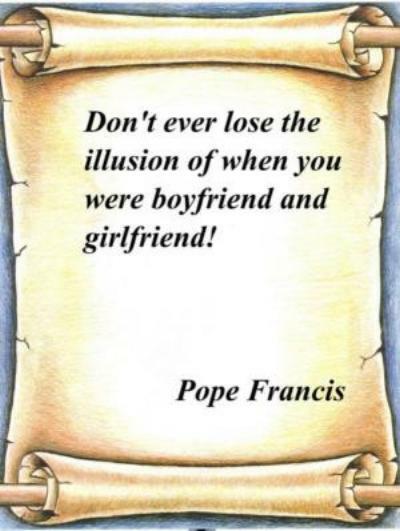 This particular quote is addressed to husbands and wives. All married couples, as they grow older, have to endure the "feeling" of love gradually fading away. 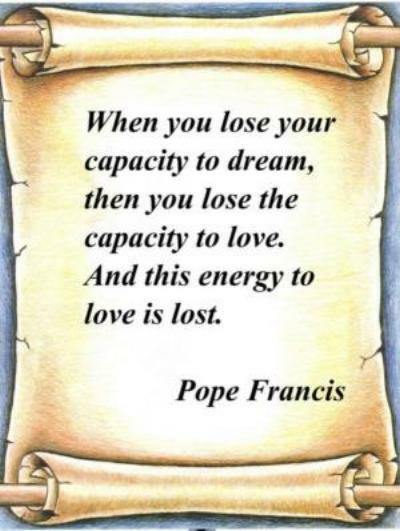 Seers and wise men advise that love is a decision, that beyond feelings there is that love that decides and acts. 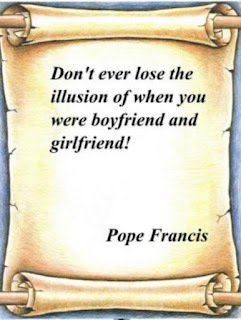 Pope Francis here challenges couples not the lose that "feeling of love" - the emotion that comes when you love your better half - even as you grow old with age. The author of Psalms composed the lyrics, "If the Lord does not build the house, in vain do its builders labor." 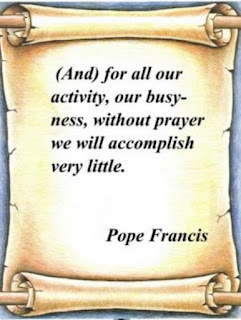 (Ps 127:1) The Pope just reiterates the message of this wonderful verse, and indeed, no effort or work of human hands will ever be fruitful without the blessing from the Lord. 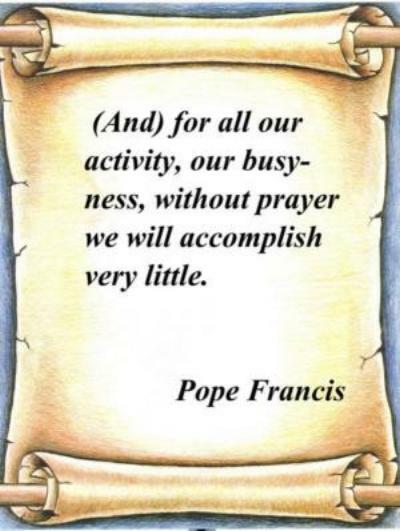 "Ora et labora" (pray and work), says St. Benedict. The Pope mentioned about how he wanted to come immediately to the places ransacked by Typhoon Yolanda (internationally called as Haiyan), how he wanted to be with those who have been devastated. He did come to Tacloban, even bracing another storm just to get there. Yet, I want to take note on the last sentence of the quote - it is not him, the Pope, who will bring consolation - it is Jesus who consoles His people because He never lets anyone down. When you are with someone who is experiencing extreme sorrow and suffering, words really will not be enough to appease and console the person. 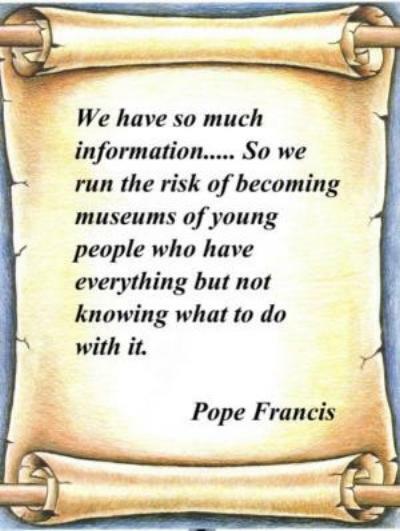 Pope Francis admits this. All we can do is to walk together, accompanying each other, and look unto Jesus for He too underwent so much suffering - He alone can understand us fully, He alone can rescue us. 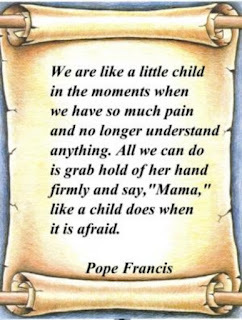 "Mama" pertains to the Blessed Virgin Mary, Mother of Jesus. 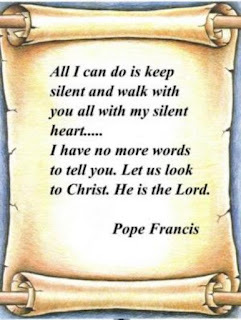 The Pope says this in connection to what he said above, that in the moments of suffering and feeling of helplessness there is the Divine whom we can hold on to and seek succor. I remember the scene from Mel Gibson's film, Passion Of The Christ, wherein Mother Mary immediately approached Jesus when He fell due to the heaviness of the cross, juxtaposed to an event when he was a small child who needed rescue from his mother. Her words were reassuring, "My Son, I am here." 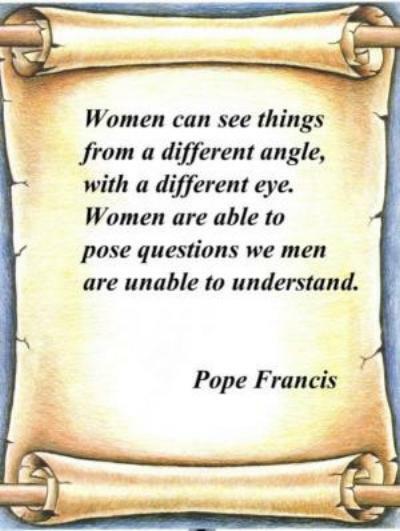 The Pope exhorts women's capacity to weep, because the capacity to weep is the ability to feel and empathize. Many people can react and respond to someone who is in need without feeling and empathizing. 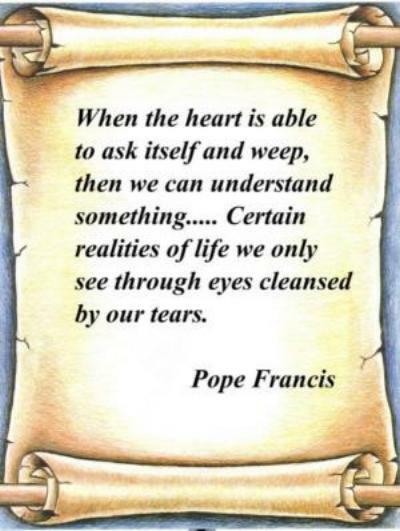 Pope Francis challenges us to "weep" so that we can feel what the person in need is undergoing, and therefore empathize with him/her. As His Holiness further laments, "There is a compassion which is USELESS... It's a compassion that makes us put our hands in our pockets and give something... If Christ had that kind of compassion, he would have greeted a couple of people, given them something, and walked on." 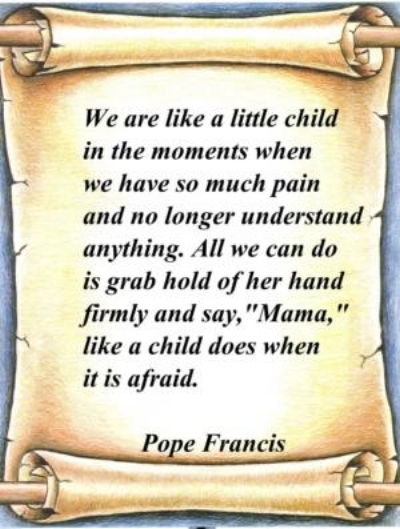 In response to the girl who wept after asking, "Why children suffer," Pope Francis honors the women of all ages because they alone have wisdom that were honed from a different perspective; and men should solicit and bow to this wisdom. 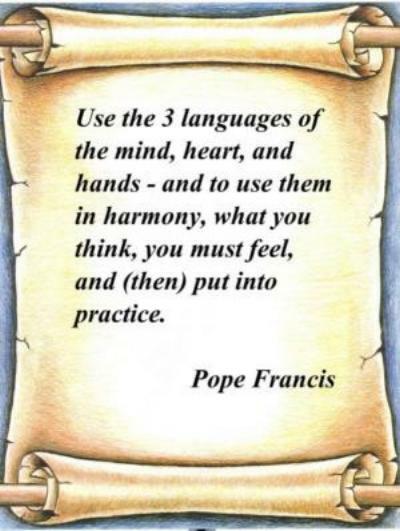 Actions speak louder than words as we all say, but knowledge without practice and application is inutile. Yet, His Holiness reiterates the need to feel - that, when you put your knowledge into action, you should not forget to feel the emotion - to sympathize and empathize. In this period of time when anything can be answered by just a click of a mouse and instant results are demanded from things and even from people, we are left with the scenario where there is no room for surprises, everything is expected and life becomes mechanically boring. 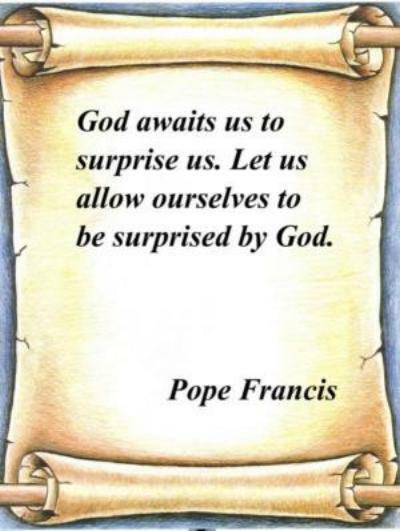 God is indeed a God of surprises! 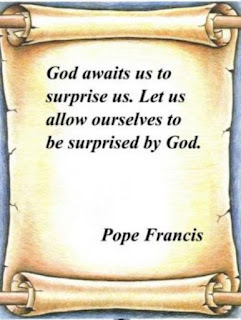 What the Pope is saying is nothing new, so he reinforces the message - if you want to be happy and always excited, pray to God that He may surprise you. Most of us are ready to give gifts - and that is alright. 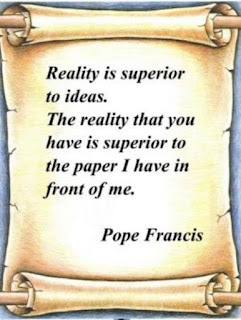 In this quote, the Pontiff is saying how valuable humility is. Being generous is one thing, but being lowly and humble enough to be the recipient of another's generosity is another challenge. Emptying ourselves and allowing ourselves to be filled by God and by the abundance of others, even if they are poorer than us, is an act humility. The act of giving provides us a sense of worth, but receiving makes as look helpless. 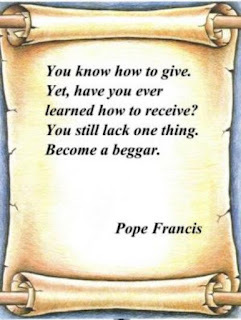 Are we humble and lowly enough to receive and become a beggar? 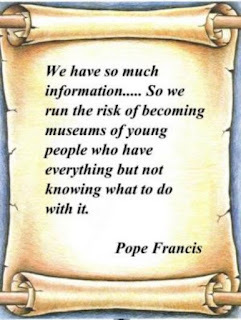 One of the qualities I admire from Pope Francis is his ability to adapt to the situation at hand. When he heard the questions from the youth or saw the tears from the orphan and the victims of Yolanda, he felt that there was a better way to disseminate God's message with such an audience. Rules and letters are important, but people, their feelings and their needs are much more important than the former. 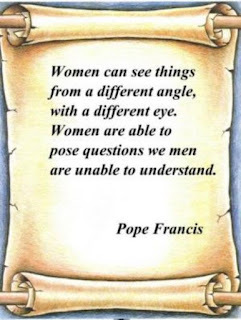 I bet there are still many wonderful quotes Pope Francis said during the Papal Visit in Manila and Tacloban. There were the speech in Malacañang and the address to the local clergy in the Manila Cathedral, which I did not mention in this article. If you think and feel there are quotes that should be highlighted and it struck your heart, feel free to mention them in the comment section below. Truly, food is not just for the body, there is a certain type of food that should be consumed to nourish the soul, and pastors like Pope Francis have the duty to feed the souls of their sheep. I hope we do listen and get fed. 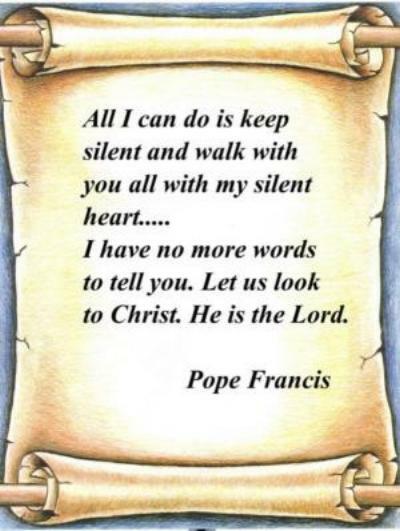 Below is a Youtube video of his Holiness' message to the Filipino youth.